Delivering cancer drugs into the heart of tumours may have just got a bit simpler thanks to magnetically-guided bacteria.1 The Canada researchers working on the cancer-killing bacteria believe they could deliver higher doses of drugs to cancers than currently possible, while shielding the body from harmful side effects. 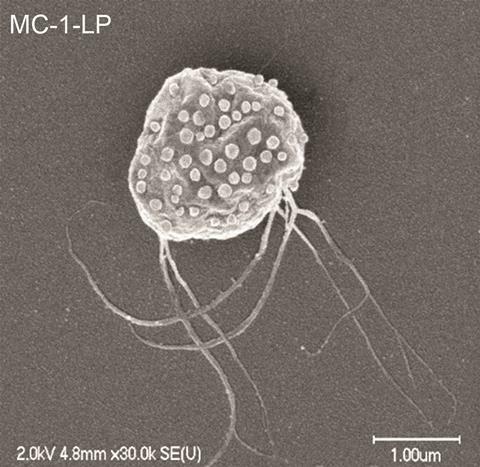 Now, Martel and colleagues have harnessed the bacteria Magnetococcus marinus as a cancer-delivery agent. These bacteria use the Earth’s magnetic field to navigate the ocean depths where the low oxygen levels are perfect for them. The researchers loaded the anti-cancer drug SN-38 into liposomes and attached these to the bacteria. They injected the bacteria into mice with cancer, and successfully guided more than half of the drug-loaded microbes to the tumour using a magnetic field. Once inside the tumour the researchers turned the magnetic field off. The bacteria then swim randomly until they sense the lower oxygen levels at the heart of the tumour and head for it. When the bacteria subsequently die they release their deadly drug cargo. At this stage the researchers have only assessed delivery of the drug, not efficacy, but Martel says that an added bonus is that the bacteria never elicited an immune response.